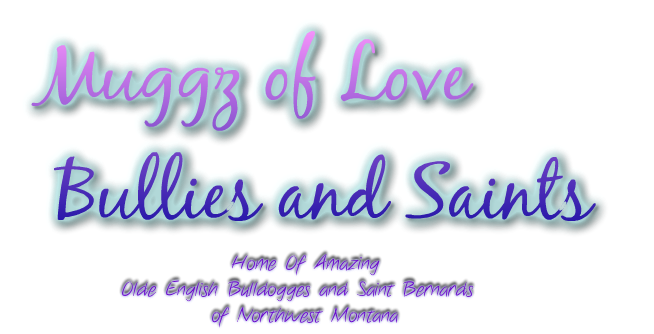 Please visit us on Facebook under Muggz Of Love Bullies and Saints for updates and pictures. I will be updating this website soon. we had some major life changes this last year and have retired and rehomed several of our pack. Thank you for understanding and being patient as we move forward and start another journey. 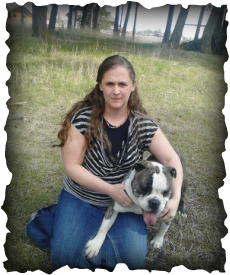 Welcome to Muggz of Love Bullies and Saints of Kalispell, Montana. This is Titanium "Titan" our Olde English Bulldogge stud from Canada﻿. Who wouldn't love an Olde English Bulldogges Mugg in their life? 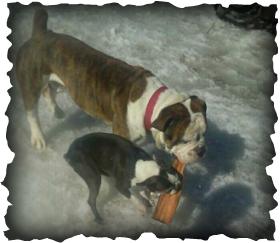 All of our Olde English Bulldogges are I.O.E.B.A registered. Sadly we had some major life changes this last year and we retired Titan and several of our other Bullies and Saints. Meet Brock our new beautiful girl from Missouri. She is bound to have some bulky babies. What an amazing Easter Present. Oh boy snow! Wow this is amazing, Montana is so different from Texas! Olde English Bulldogges are docile, but capable and protective, fearless and athletic, fierce-looking, determined and courageous, bold and friendly around their family and friends, but fearless adversaries to anyone who threatens their masters or property. This breed likes to chew and should be supplied with plenty of toys and bones. Nylabones and rubber Kong toys are highly recommended. Rawhides, soft rubber and stuffed toys are unsafe, for they are easily shredded or swallowed whole. Olde English Bulldogges are so eager to please that they may overexert themselves in an effort to do whatever is asked of them. An owner who displays a natural authority toward the dog,socialization and obedience training are important. It is best to channel high energy individuals to some type of work and exercise. The objective in training this dog is to achieve pack leader status. It is a natural instinct for a dog to have an order in its pack. When we humans live with dogs, we become their pack. The entire pack cooperates under a single leader. Lines are clearly defined and rules are set. Because a dog communicates his displeasure with growling and eventually biting, all other humans MUST be higher up in the order than the dog. The humans must be the ones making the decisions, not the dogs. That is the only way your relationship with your dog can be a complete success. This breed tends to drool and slobber. The Olde English Bulldogge is a very new and rare breed developed by David Leavitt by the crossing of half English Bulldog, and the other half: Bullmastiff, Pit Bull and American Bulldog. In 1971 he became disenchanted with English Bulldogs due to their breeding and breathing problems. He discovered that they didn’t look like their ancestors who were healthier and less extreme. David's goal was to produce a dog with the looks of the 18th century bulldog, with the temperament of today's English Bulldogs, yet healthy, without breathing problems, or all the other aliments today's English Bulldogs are prone to. This new breed can now breathe. They will never be like hounds, able to run for miles during the hottest weather of summer, but they’re three times better than the restricted modern Bulldog. Cesarean section births are not necessary. Artificial insemination, due to male ineptness and lack of drive, has been replaced by natural ties. Lifespan is over eleven years. All breeding stock has had hip x-rays. No dog with bad hips is bred. David says he is now achieving his goal of producing a Bulldog with the health and temperament to be able to serve people, instead of forcing people to serve him. David Leavitt is breeding them to more of a working lines type dog, while OEBKC is breeding the dogs as more of a family oriented dog. Titan and everyone's boss Phiz the Boston Terrier.